South Ari Atoll has many excellent thilas, both within the atoll and in the channels. There are also four wreck dives. One of the feature areas is Dhigurashi Kandu, where the thilas spring up from the outer rim of the atoll-like ten pins in a bowling alley. There are around 12 thilas in the 4.5 km wide channel of which only a handful are frequently dived. Some are quite deep and hard to find, and the frequent swift currents and choppy seas can make diving conditions hazardous. Only experienced divers with knowledgeable boatmen should attempt the diving here at these times. 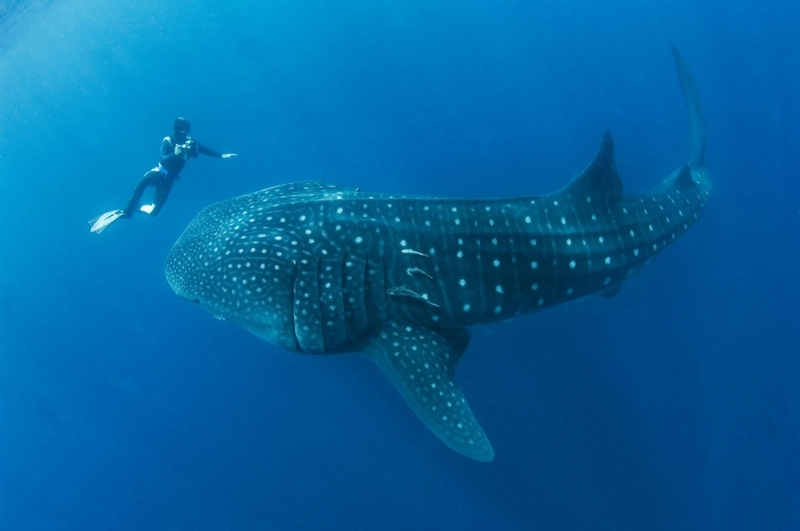 The southern outside reef in the vicinity of Ariyadu Kandu has become famous for the regular year-round appearance of whale sharks. 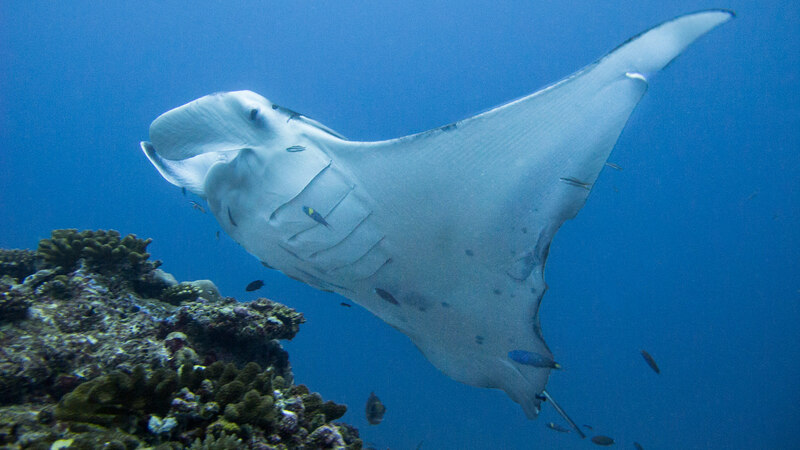 Mantas and sharks are also prevalent at many locations, with Madivaru being the most documented site for manta rays. South Ari Atoll has many excellent thilas and four wreck dives. On the outside of Vilamendhoo is a narrow thila that rises from 25 meters at either end to six meters in the center. On the west side is a steep drop-off with caves from 10 to 25 meters. 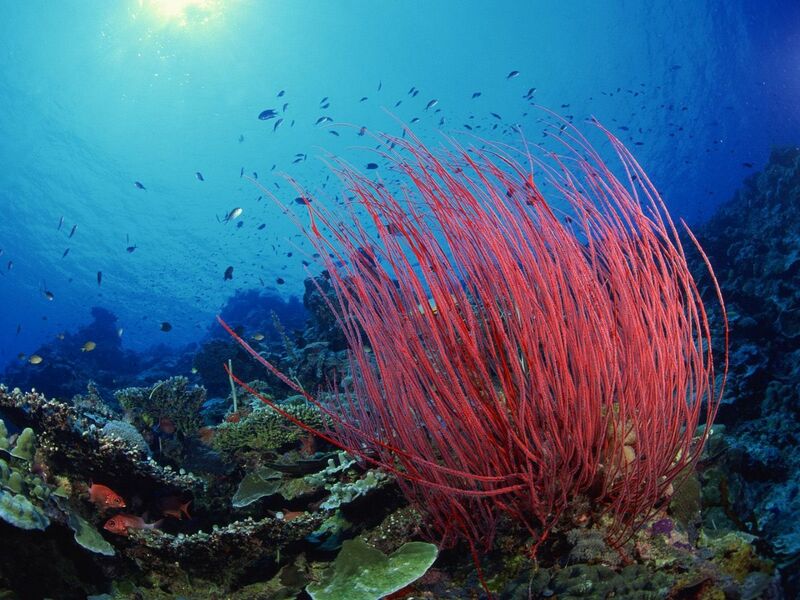 There are many large sea fans here, good hard and soft corals and plenty of fish life. The outside slopes more gradually to 25 meters. At the northern end is a big rock and cave at 25 meters. There is good coral on the reef top and mantas are often seen in this area. There is good coral on the reef top. This thila is a 500-meter-long thila lying east to west in Dhangethi Kandu. It then swings north for another 250 meters outside Viligilivaru. The thila rises to six meters from the sandy channel floor at 20 meters. Dhigurah Thila is the biggest thila in the channel and is also the most visible from the surface. The long-sausage-shaped thila is about 500 meters long with the best diving on the northeastern side. 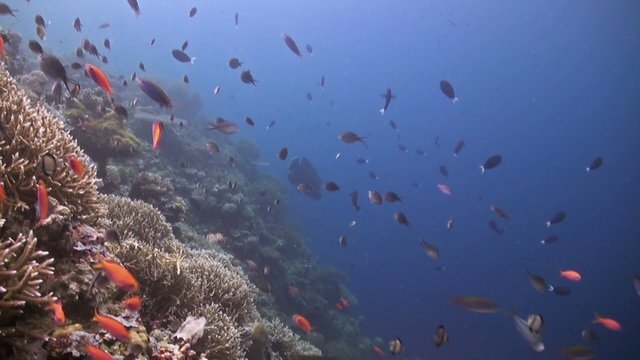 The reef edge is at 10 meters, and for most of the reef, there are overhangs beginning at 15 meters that step down in tiers to the bottom at about 30 meters. There are at least three caves, one at a depth of 18 meters with a deep cut 50 meters in length. Inside, on the cave floor is a forest of long sea whips, sea fans and black coral bushes with bright yellow feather stars. 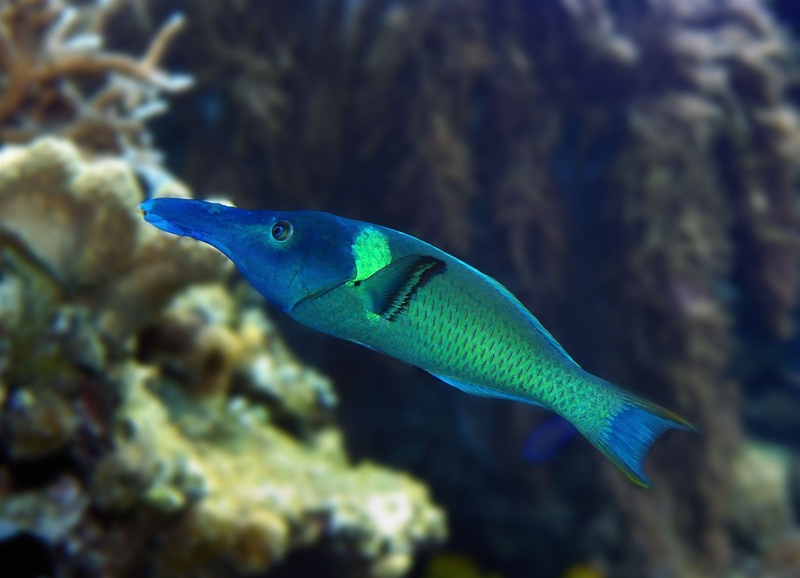 There are many smaller species of wrasse, cardinal fish and tiny shrimp. On the cave floor is a forest of long sea whips, sea fans (seen above) and bright yellow feather stars. At the eastern end of the reef is a prominent rocky outcrop. It looks to have once been a cave that has now collapsed. At this end are higher concentrations of pelagic fish with many tuna, shark, and jacks. 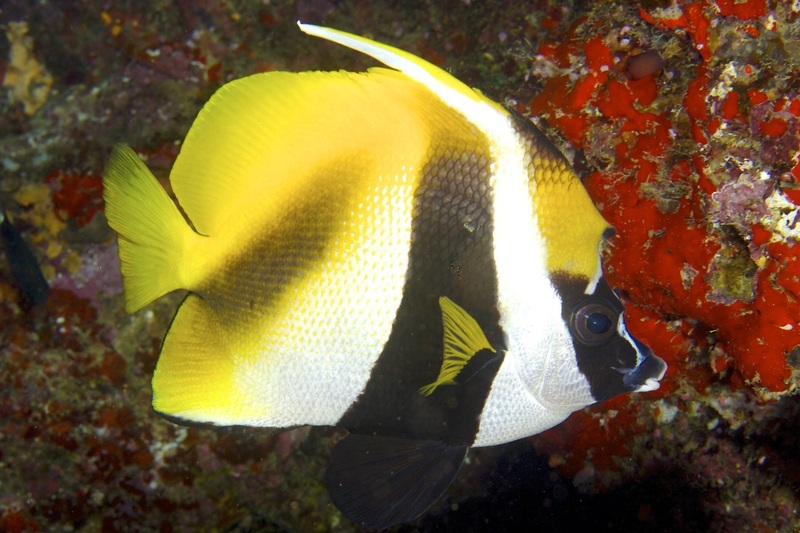 Emperor angelfish, both juvenile and adult, are commonly seen all along the reef slope. There are also large numbers of big-nose unicorn fish and scribbled file fish as well as massive schools of blue-dash and yellow-back fusilier. There is healthy coral on the reef top and soft coral hanging off the ledges. Because of its large size, this thila is given preference over the other thilas in the channel when weather or current conditions are marginal. There are also large numbers of scribbled file fish. Broken Rock is the most eastern thila of those commonly dived in Dhigurashi Kandu. It is around 80 meters long and what clearly distinguishes this thila from the others in the channel, is a canyon, about one to three meters wide and up to ten meters deep. It slices through the reef from the southeast to the northwest. The top of the reef is 12 meters, and the canyon reaches a maximum depth of 24 meters. Another large rock exists on the eastern side of the reef. There are many different ways to dive this thila, but swimming carefully through the 50-meter-long canyon is one the highlights. 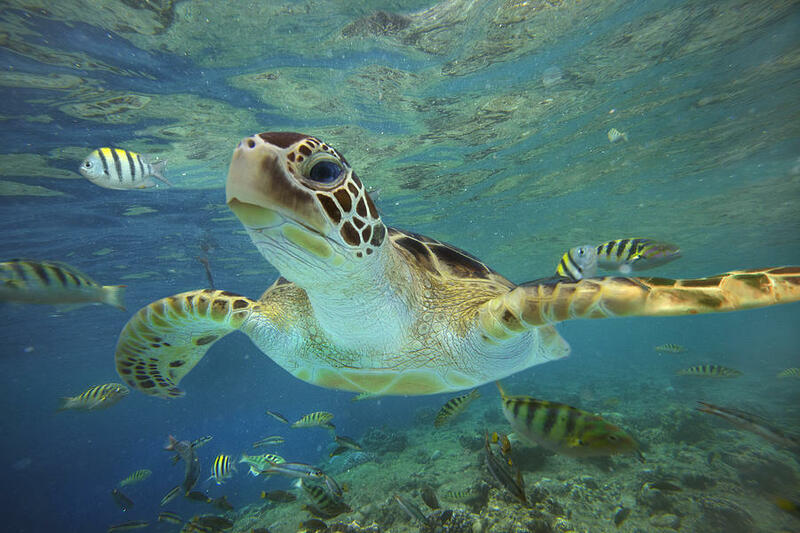 The strong currents and protected pockets on the reef have made an ideal environment for an amazing variation in marine life from strong branching sea fans and soft coral to schools of barracuda, fusilier, tailfin batfish and turtles. Photographers will have numerous surprise photo opportunities here, however, extreme care should be taken against damaging the coral. When the current is running is not advised to take cameras as sharp corners, jutting outcrops and narrow squeezes make this site especially vulnerable to diver damage. This is a small, deep, flower-shaped thila located 50 meters from a larger reef that rises to six meters. Diving usually begins and finishes on the larger reef, where there are caves and overhangs at shallower depths. An open water safety stop is often required with a strong current. The walls of the canyons and floors of the deep overhanging caves are covered with sea fans and sea whips. This is a challenging dive and delightfully memorable thila; one of the jewels in the chain of thilas scattered across the channel. The walls of the canyons and floors of the deep overhanging caves are covered sea whips. In Dhigurashi Kandu is a stunning thila between eight and 25 meters, featuring caves with sea fans and soft corals. Fish life is abundant, and coral growth is excellent. 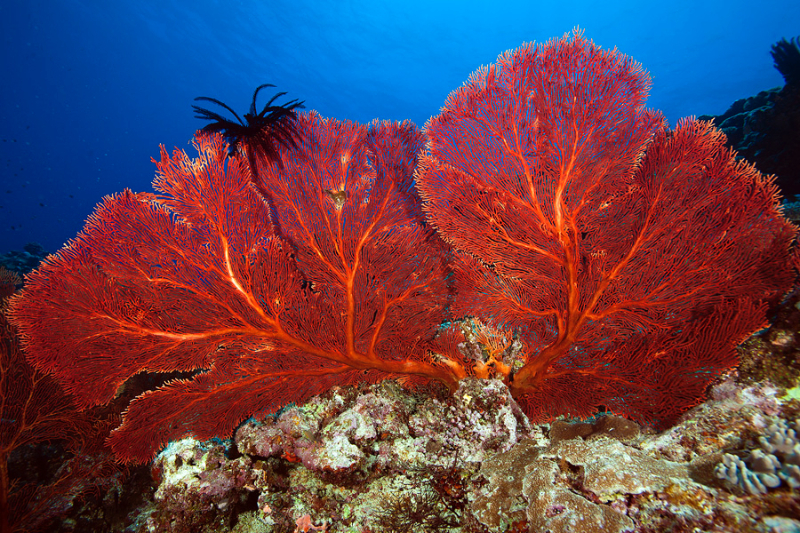 The thila has one of the most spectacular displays of sea fans to be found anywhere in the atoll. Along the walls and inside the caves are large, healthy sea fans – an indication of the strength of the currents flowing in and out of this channel. The 100-meter oval-shaped thila begins at eight meters and drops to over 30 meters. Much of it is a continuous line of ledges, caves, and overhangs, mostly at depths from 14 to 20 meters. 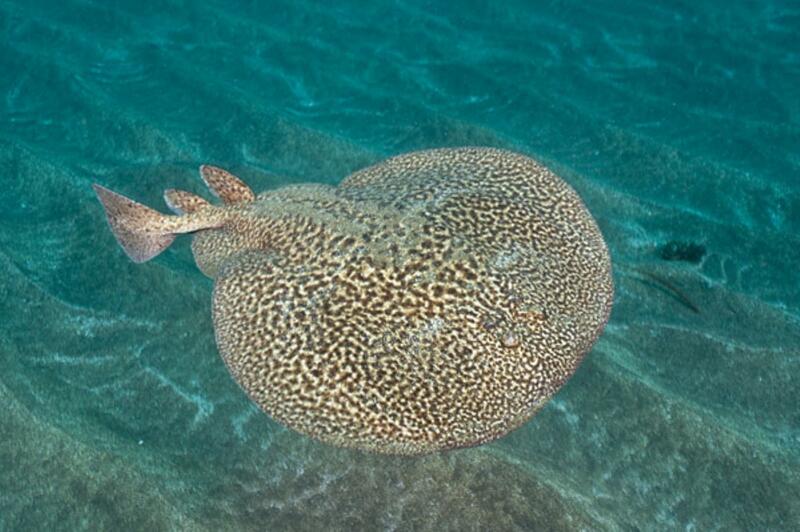 In the caves are many surprises including an occasional electric ray and nurse sharks. To the southeast are some interesting reef outcrops with overhangs and caves. In the caves are many surprises including an occasional electric ray. This is a drift dive covering about 300 meters of reef edge to the west Dhigurah on the inside of Dhigurashi Kandu. The top of the reef is between three and five meters and drops away steeply to 24 meters. The reef edge is seen on the surface by the change in iridescent blues. The arches have an interesting reef formation that is full of surprises. Along the reef edge are numerous small inlets, some five meters wide, others 10 or 15 meters in width, all occurring one after the other with depths to 15 meters. One never knows what to expect in the next inlet. Coral growth is good and among many of the inlets are coral outcrops with plenty of small reef fish. There are a few small caves, some with sea fans. During the south-west monsoon season, schooling mantas and whale sharks are frequently seen. During the south-west monsoon season, schooling mantas are frequently seen. One of the most exciting dives in the South Aril Atoll is Kudarah Thila. The reef top is at 14 meters with sharp drop-offs to 20 meters and 25 meters on the most sides. There are isolated outcrops of rocks on the west side, a small canyon on the north side and a big, long cave at 20 meters on the eastern side. When the current is not too strong, divers can swim around this 80-meter-long thila without too much difficulty. On the deeper more, gentle slopes on the northern side are vast expanses of large sea fans. Such fields of fans are rarely seen, and when the current is flowing, they all sway as one. Swimming around the fan slopes are some grey and white-tip reef sharks, and pelagics like rainbow runner, great barracuda, blue-fin jack and tuna are drawn from the surrounding waters and seen in abundance. The reef outcrops on the western side are coated in soft coral and swimming around them are tailfin batfish. 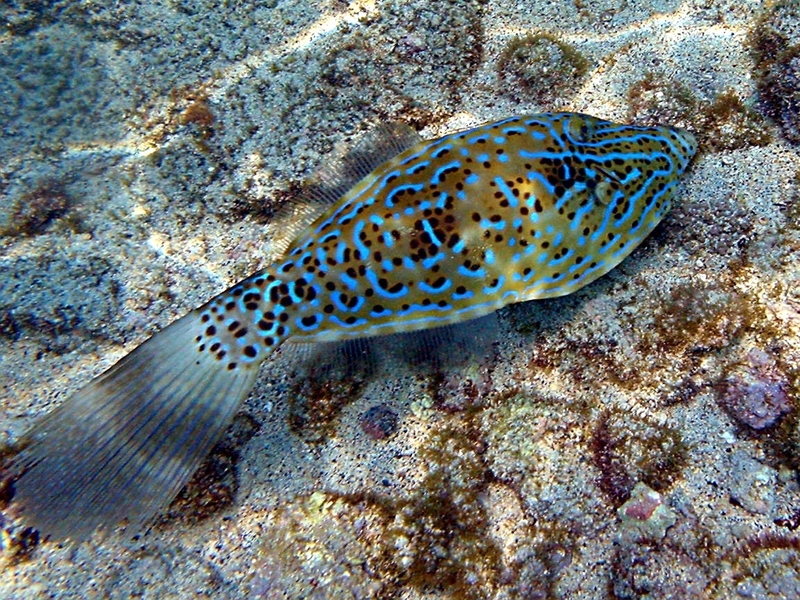 On the sand and rubble flats between the reefs at 15 meters are many species of goby, like the red fire dart goby and other small burrowers. At the big cave on the eastern side are many squirrelfish, some pufferfish, grouper, and small fans and black coral bushes. At the northern end of the cave is a swim-through to the top of the reef. On the south side are many squirrelfish, some pufferfish, grouper, and small fans and black coral bushes. There is a small canyon on the top with many smaller fish. On the sand and rubble flats between the reefs at 15 meters are many species of goby, like the red fire dart goby and other small burrowers. This is strictly a dive for experienced divers. Strong currents are frequent, and divers will usually start up-current and be required to descend quickly to the thila in these conditions. Unfortunately, the reef top, which is rich in coral, bears many scars from boats that have in the past anchored on the reef top. There are very few wall dives in the South Ari Atoll that can match this dive. It has several features worth noting as they will ultimately determine the type of dive made here. Near the northern end of Kudadhoo island is a small ‘bite’ in the reef perhaps 15 meters wide which starts at the reef top at three meters and drops to 12 meters. In the middle of the bite is a large coral rock that gives a canyon effect. In this small canyon are black coral bushes, tailfin batfish, masked bannerfish, and soft coral. Over the reef edge directly below the bite, the wall drops sharply to sand at 30 meters. Near the base of this wall are four large boulders which look like they have broken away from the bite above. Fish life, coral and canyons are exceptional here. The steep wall continues to the corner of Ariyadhoo Kandu and is undercut at the base at 28 meters. At the undercut are black coral bushes with oyster shells, sea whips, sea fans, and giant flower grouper. This sheer wall is coated in a layer of invertebrates that attract Moorish idols and long-nosed butterfly fish, as well as big-nose unicornfish, blue-faced angelfish and clown triggerfish. 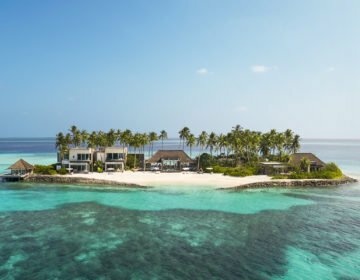 Divers can continue their drift dive around the corner into Ariyadhoo Kandu where the wall becomes less steep. One good option though is to spend the remainder of the dive on the corner above the wall at 12 meters where there is a profusion of hard coral and reef fish. The variety of fish life here is stunning, with many smaller species like the distinctive bird wrasse, the ring-eye hawkfish and the long-nose butterflyfish being prevalent. There are also large morays and Napoleon to ensure all types and sizes are well represented. 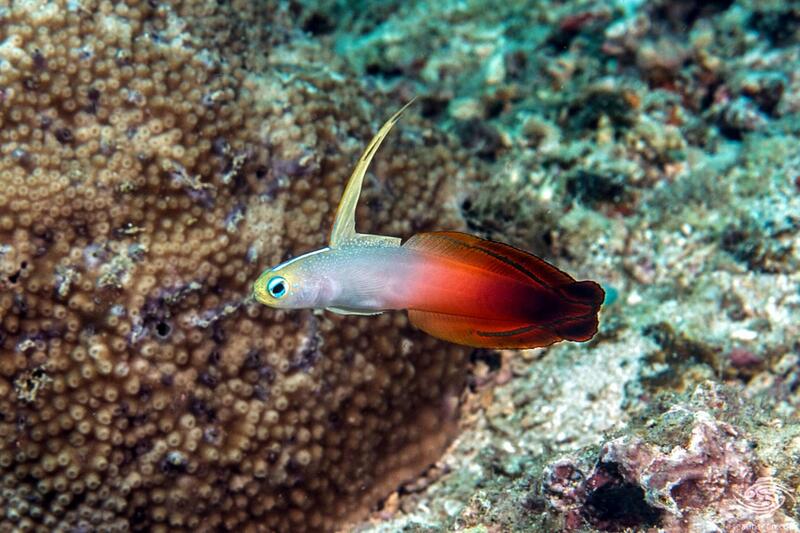 The variety of fish life here is stunning, with many smaller species like the distinctive bird wrasse. 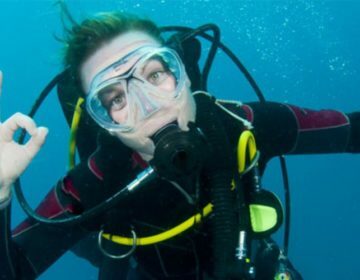 If diving with an outgoing current, it is a good idea to start before the bite and stay at 12 meters or above where there are some caves and overhangs. Once at the bite, then descend to the boulders at 30 meters. It is a good idea to limit the time spent around the rocks to about five minutes so that plenty of bottom time remains for the undercut in the wall at 28 meters. Kudadhoo Point and Kudadhoo Beyru is a leisurely drift dive where the reef slopes gently from five to 20 meters. The reef then drops steeply to greater depths. Whale sharks are regularly seen along this reef, as well as grouper and Napoleon. Whale sharks are regularly seen along this reef. 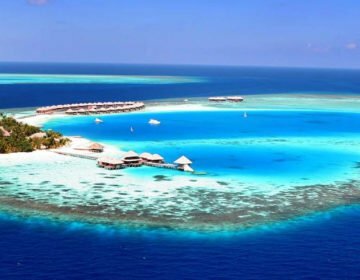 About 1.5km east of Kudadhoo Beyru, the outside reef has excellent fish life but is better known for its whale sharks, which visit here more often than any other site in the atoll. Between May and November, the whale sharks and mantas continually return to this outside reef to feed and can often be seen on a daily basis. A mother and calf have been regularly sighted here as well as whale sharks traveling alone. The western side of the island has a good, long reef sloping to 30 meters with caves at either end. The eastern side wall is steeper.